A couple of days ago ElvisMatters reported that at least one show (the one in Slovakia) of the upcoming Elvis Presley In Concert video tour in Europe next month has been cancelled due to disappointing ticket sales ("an unconfirmed rumour off the record confirmed to us"). And also that a "second show in another country may be cancelled too." As I've got tickets to the concert in Copenhagen on March 24 I was a bit afraid that was going to be that "second show." But according to an update from Elvis.com that I received today it's still possible to buy tickets to all the shows, including the one in Slovakia. So it looks like those unconfirmed rumours were false and I can put my fears to rest. 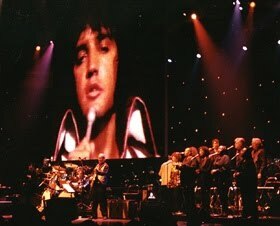 This will be the fifth time I see the video-projected Elvis reunited with his former band members live on stage, and though I'm not as excited as I was the first time, I'm still looking forward to it. Especially since Norbert Putnam, who played with Elvis' seventies studio band, has been confirmed as the bass player for the tour, replacing bass player Nathan East (who never played with Elvis), who in turn replaced regular TCB Band bassist Jerry Scheff.